Pearl engagement rings are great options for the woman who loves a classic look with a sensitive feel. Pearls are elegant, simple stones not only for rings, but also earrings, necklaces, brooches, and more. Pearls are a romantic stone, which is why they are often included as either the main stone in an engagement ring or in the detailing. A Classic through the Years Pearl jewelry is timeless and has been around for centuries. While most people are familiar with pearls, they aren’t featured in engagement rings as often as other stones such as diamonds or even bold colored gemstones. 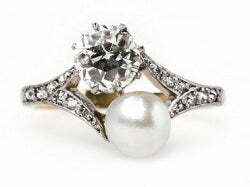 This makes pearl engagement rings perfect for those who love a time-honored tradition that is also a bit different. Bridal Must Haves Pearls are associated with purity and innocence, which is why they often make an appearance on wedding gowns and other bridal items including jewelry. In fact, a string of pearls is often given to a bridesmaid or maid of honor as a wedding gift. Huckleberry You don’t always have to choose one or the other: Huckleberry gives you the best of both worlds with a dazzling diamond and a delicate pearl. When it comes to pearl engagement rings, this one includes a cream-colored pearl that measures over five and a half millimeters. The sensitivity of the pearl is balanced by the bright, shimmering .76 carat diamond. The yellow gold complements both the pearl and the diamond, making it the perfect addition to Huckleberry. An additional array of diamonds on the band adds a touch of sparkle and pulls the look together, making this Edwardian-era ring a total knockout. Fairchild Even if the main focal point of a ring is not a diamond, it is not uncommon for diamonds to make an appearance in the detailing around the other stones or on the band. Pearl engagement rings often feature diamonds, but unlike Huckleberry, the diamonds in Fairchild only help to make the 4.6 mm pearl stand out. 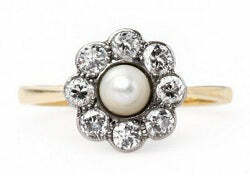 This floral ring is finished with a simple gold band that enhances the pearl and diamonds without being over the top. Smokey Hill On the flip side, a pearl doesn’t have to be in the center to make an engagement ring really pop: case in point, Smokey Hill. This vintage-inspired ring is designed after one of the most popular rings ever featured on Trumpet & Horn. 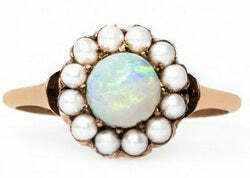 It is feminine, romantic, and has an air of mystique due to the combination of opal and pearl. Similar to other pearl engagement rings such as Fairchild, Smokey Hill has a floral appearance, but instead of the diamonds acting as the petals of the flower, pearls play that part. Twelve seed pearls form a halo around a gorgeous and intriguing half carat opal. A rose gold band makes this ring even sweeter and a great choice for pearl lovers. Trumpet & Horn carries a variety of engagement rings so that you can find the perfect option. Go to Trumpet & Horn today to read more about the pearl rings featured here and to see our entire collection of vintage and vintage-inspired jewelry.